This franchise was established (by established we mean the year of the franchise’s first game) in 1974. The franchise has always been known as the Washington Capitals. If you love the Washington Capitals and the history of the Capitals franchise, you might really love to own an original piece of artwork celebrating the team's historic jerseys as seen in the poster at the top of this blog - you can actually own one of those original pieces of art! There are only 12 pieces of original art available for sale, and when these 12 are sold, that's it, they're all sold out. If you would like more information about this great artwork including the three ways you could purchase each piece, please visit our Washington Capitals YouTube video at www.youtube.com/watch?v=LXl96z7OIp8 or go directly to the artwork website www.heritagesportsart.com/Washington-Capitals-c193/ where you can see and purchase the artwork. Please note that the actual original, highly detailed, hand-drawn pen and ink sketches used for the 2 arena images shown above are available for sale as a complete collection to one Capitals fan. If you are interested in being the one and only owner of this complete and original collection of Washington Capitals arena images, please contact me by email ssillcox@rogers.com and I can explain how they can all be framed in one beautiful piece. 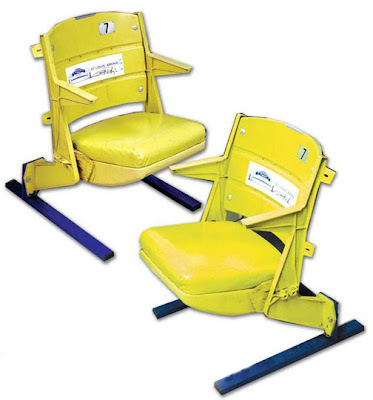 This franchise was established (by established we mean the year of the franchise’s first game) in 1970. The franchise has always been known as the Vancouver Canucks. 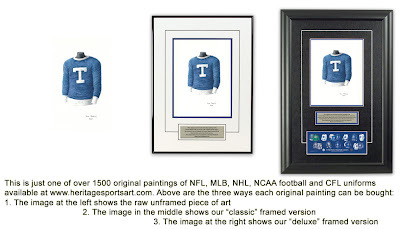 If you love the Vancouver Canucks and the history of the Canucks franchise, you might really love to own an original piece of artwork celebrating the team's historic jerseys as seen in the poster at the top of this blog - you can actually own one of those original pieces of art! There are only 13 pieces of original art available for sale, and when these 13 are sold, that's it, they're all sold out. If you would like more information about this great artwork including the three ways you could purchase each piece, please visit our Vancouver Canucks YouTube video at www.youtube.com/watch?v=AwrJvnpTgxQ or go directly to the artwork website www.heritagesportsart.com/Vancouver-Canucks-c192/ where you can see and purchase the artwork. Please note that the actual original, highly detailed, hand-drawn pen and ink sketches used for the 2 arena images shown above are available for sale as a complete collection to one Canucks fan. If you are interested in being the one and only owner of this complete and original collection of Vancouver Canucks arena images, please contact me by email ssillcox@rogers.com and I can explain how they can all be framed in one beautiful piece. This franchise was established (by established we mean the year of the franchise’s first game) in 1967. The franchise has always been known as the Pittsburgh Penguins. If you love the Pittsburgh Penguins and the history of the Penguins franchise, you might really love to own an original piece of artwork celebrating the team's historic jerseys as seen in the poster at the top of this blog - you can actually own one of those original pieces of art! There are only 16 pieces of original art available for sale, and when these 16 are sold, that's it, they're all sold out. If you would like more information about this great artwork including the three ways you could purchase each piece, please visit our Pittsburgh Penguins YouTube video at www.youtube.com/watch?v=ign6wDpWiEI or go directly to the artwork website www.heritagesportsart.comPittsburgh-Penguins-c187/ where you can see and purchase the artwork. Please note that the actual original, highly detailed, hand-drawn pen and ink sketches used for the 2 arena images shown above are available for sale as a complete collection to one Penguins fan (the Consol Energy Center image will be completed soon). If you are interested in being the one and only owner of this complete and original collection of Pittsburgh Penguins arena images, please contact me by email ssillcox@rogers.com and I can explain how they can all be framed in one beautiful piece. This modern franchise was established (by established we mean the year of the franchise’s first game) in 1992. Since that time the franchise has always been known as the Ottawa Senators. But there were some "predecessor teams" in Ottawa that I feel are "linked" to the modern Senators franchise, and here is some of that information. A. 1883 – 1909: Ottawa Hockey Club/Senators/Silver Seven were a (mostly) amateur team that won the Stanley Cup 12 times [5 different seasons] in this period of time and played in a variety of leagues including the CAHL, FAHL and ECAHA. C. 1917 – 1931 and 1933 – 1934: Ottawa Senators left the NHA and became a founding member of the NHL. During their initial NHL run, they won the Stanley Cup 4 times [4 different seasons]. D. 1934 – 1935: Ottawa franchise moved to St. Louis and became St. Louis Eagles. The franchise was disbanded after the 1934-35 season. Thus it is said that Ottawa teams (mainly known as the Ottawa Senators) won the Stanley Cup 11 times (ie in 11 different seasons) prior to 1935. Please note: If anyone has a photo or sketch or plan that shows the exterior of this rink, I would greatly appreciate any information you might be willing to share - contact me at ssillcox@rogers.com . This is the most famous image of a tiny portion of the rink - it comes from a photo of the Dawson Creek (Yukon Territory) team that travelled across Canada to challenge Ottawa for the Stanley Cup. If you love the Ottawa Senators and the history of the Senators franchise, you might really love to own an original piece of artwork celebrating the team's historic jerseys as seen in the poster at the top of this blog - you can actually own one of those original pieces of art! There are only 16 pieces of original art available for sale, and when these 16 are sold, that's it, they're all sold out. If you would like more information about this great artwork including the three ways you could purchase each piece, please visit our Ottawa Senators YouTube video at www.youtube.com/watch?v=xhgww7Tp2OQ or go directly to the artwork website www.heritagesportsart.com/Ottawa%20Senators-c184/ where you can see and purchase the artwork. Please note that the actual original, highly detailed, hand-drawn pen and ink sketches used for the 8 arena images shown above are available for sale as a complete collection to one Senators fan. If you are interested in being the one and only owner of this complete and original collection of Ottawa Senators arena images, please contact me by email ssillcox@rogers.com and I can explain how they can all be framed in two beautiful companion pieces. This franchise was established (by established we mean the year of the franchise’s first game) in 1926. The franchise has always been known as the New York Rangers. 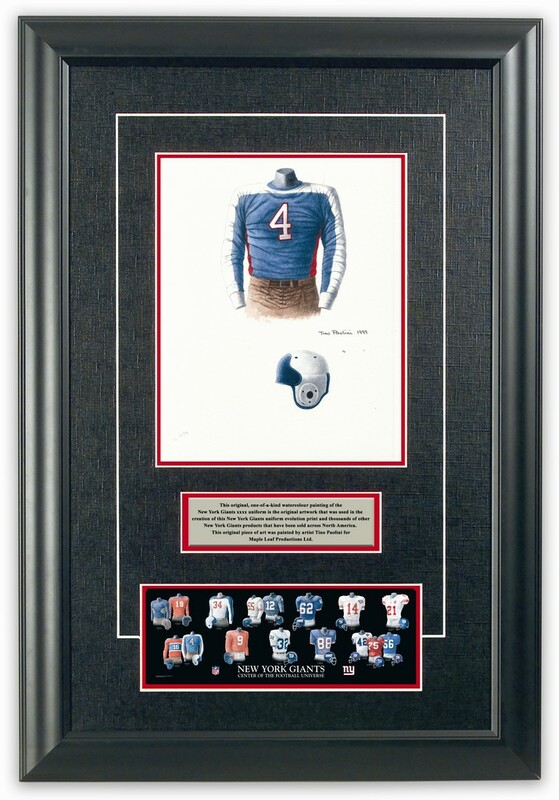 If you love the New York Rangers and the history of the Rangers franchise, you might really love to own an original piece of artwork celebrating the team's historic jerseys as seen in the poster at the top of this blog - you can actually own one of those original pieces of art! There are only 15 pieces of original art available for sale, and when these 15 are sold, that's it, they're all sold out. If you would like more information about this great artwork including the three ways you could purchase each piece, please visit our New York Rangers YouTube video at www.youtube.com/watch?v=zP7zpN_OMM8 or go directly to the artwork website www.heritagesportsart.com/New-York-Rangers-c183/ where you can see and purchase the artwork. Please note that the actual original, highly detailed, hand-drawn pen and ink sketches used for the 2 arena images shown above are available for sale as a complete collection to one Rangers fan. If you are interested in being the one and only owner of this complete and original collection of New York Rangers arena images, please contact me by email ssillcox@rogers.com and I can explain how they can all be framed in one beautiful piece.